20 July 2011 1st Zone Meeting held at RT Centre Section 14, PJ from 8 - 10 pm attended by President Katherine, Secretary Poh Ling & Treasurer Nancy. 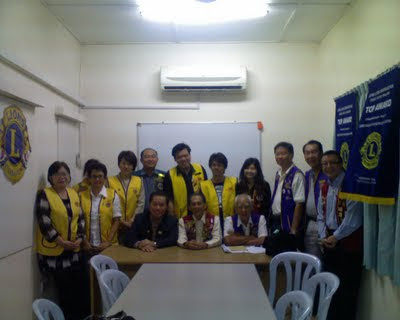 10 July 2011 Our 12th Annual General Meeting chaired by IPP Lynda was held at Fatty Two Restaurant, SS2, PJ at 7 pm. 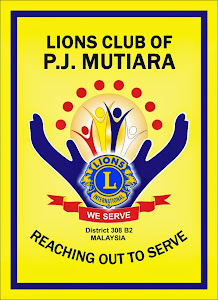 Region 8 Chairman Soong Kok Hoong gave the Club an early monetary boost by giving his personal contribution of RM1,000 towards the Club's Admin Fund which was accepted by 2011/12 President Katherine. 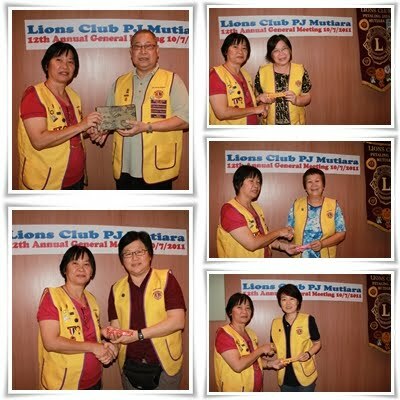 Agenda for the AGM proceeded smoothly and IPP President Lynda presented her personal pin & appreciation to all members. This was followed by Customary President's Appreciation presented by PP Nelson to IPP Lynda. 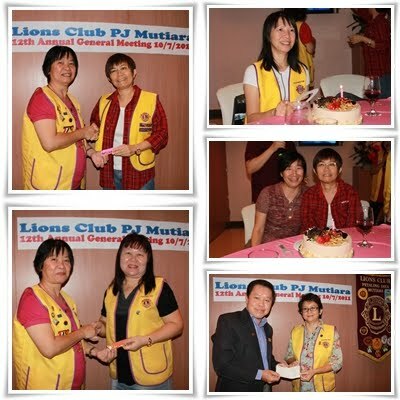 We had a sumptous dinner followed by karaoke session and celebration of June [Lion Yvonne & Jamie] and July [Chwee Chin] member's birthday and the AGM adjourned at 10.30 pm with vote of thanks to all in attendance. OC Katherine met single parent Mdm. Gan A Leong 2 months ago and learned that Mdm. Gan needed professional guidance for her 13-year old daughter Li Jing who she feels is suffering from inferior complex and does not show any interest in her studies. 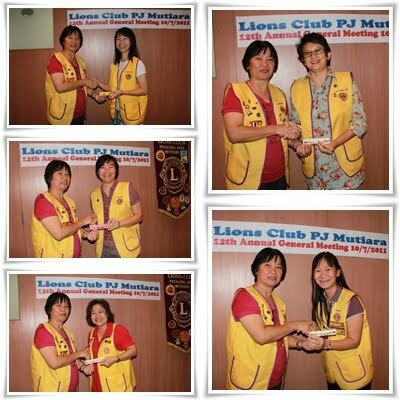 After much deliberation at our Lions meeting, members felt that guidance should be from a professional level. With the assistance of Lion Jessie, we managed to contact Ms. Barbara Yen. Ms. Barbara Yen obtained her qualification in education from the College of Preceptors, UK. She later trained as a medical social worker at the University of Singapore in 1972. Subsequently, she received her continuing education from the Schools of Social Work, Indiana University and Pittsburgh, USA, and University of St. Mary, Canada. She spent 25 years with the University of Malaya Medical Centre, serving in various departments including Medicine, Paediatrics, Primary Care Medicine, Psychological Medicine, Eye and ENT. She has experience working on issues of abused children, sexual assault, sexual harassment, domestic violence, mental illness, disabilities and HIV/AIDS. Since 1967 till presently, she has been a committee member or a volunteer to about 15 NGOs and has helped draft training modules for the Ministries of Health, Education and Women and Family Development. Her passions are in human and animal rights, environment conservation and world peace through Buddhist teachings and inter-faith understanding. Presently, she is an adviser and counsellor to the Buddhist Gem Fellowship Counselling Unit, Kuala Lumpur. She helps to organise its para-counselor training course as well as its marriage education programs. Sunday 3 July 2011, President Katherine with Lion Dr Karen Lee accompanied 13- year old daughter Li Jing for a consultation session with Ms. Barbara Yen at a coffee shop in Tropicana City Mall, Petaling Jaya. The ambience made her opened up very quickly especially Ms. Yen started talking Cantonese to her. Below is Ms. Yen’s opinion. - she is bored n lonely. 2 older sisters are married n does not visit often, older brother is in college. - Father passed away when she was 4 years old. - Mother works at a bookshop n on weekends, works as a sales promoter. - no one to see that she gets up in time to go to school or see that she reaches school. She turned to stray cats near the flat where she lives by feeding them. This gives her some meaning in life. She has some interest in music, swimming n is also attending taekwando class. She strikes me as an introvert but a likeable n caring person. - mother to have one rest day so that she can have quality time with child. If possible, other siblings should be encouraged to visit often. - If all these fail as a last resort, after discussing with her the options, perhaps temporary stay in a children's home until she is a little older n safe to be left on her own. It will be good if Lions can temporary 'foster' her by helping her with school aid, tuition fees so that mother does not have to work so hard. I believe their flat needs some repair too. A safe, clean n cosy house will make her want to stay home more. I believe Dr Karen has offered to take her swimming. That will be good. Perhaps can include her when here are parties for children's home. Case can be reviewed once her brother is earning. Shall give further feed-back after i have seen mother. 1 July 2011, 1st Business Meeting chaired by President Katherine Yong recorded 93% with only 1 absentee with our 1st guest for 2011/12 ex-Lion Vincent Leong.